Legendary rabbi of the eleventh century; reputed to have been the greatest magician and necromancer of his time (Tritheim, "Annales Hirsaugienses," i. 203). There is a legend that Archbishop Eberhard of Treves issued on April 15, 1066, an edict that those Jews who refused to be baptized on the Saturday preceding Easter must leave the country. The same legend says that Eberhard prepared himself on that Saturday for a general baptism of the Jews, but that the latter by magic brought about his sudden death just before the time appointed for baptism. Tritheim (l.c.) 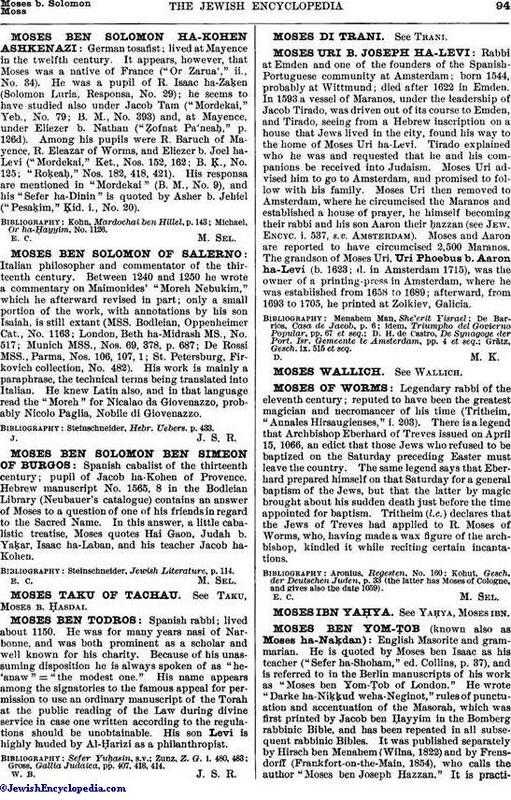 declares that the Jews of Treves had applied to R. Moses of Worms, who, having made a wax figure of the archbishop, kindled it while reciting certain incantations. Kohut, Gesch. der Deutschen Juden, p. 33 (the latter has Moses of Cologne, and gives also the date 1059).